I meant to get to this yesterday, but obviously that didn’t happen. 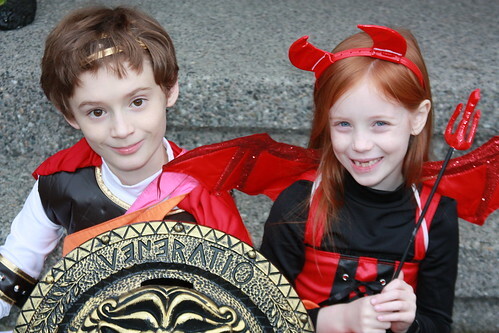 In any case, I decided the kids were way to cute not to share even though I am late. 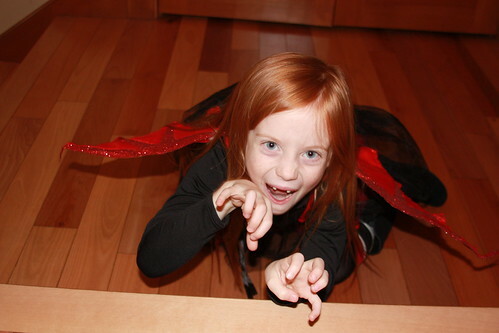 Gilly decided to be a devil this year. 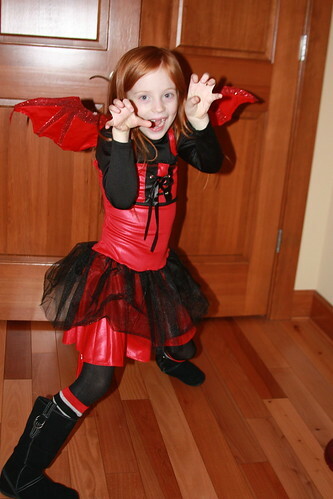 Take moment to imagine our expression when she announced, “I’m going to be a little devil for Halloween. It’s perfect for me.” She is certainly devilish and downright adorable. Did you notice she is now missing both front teeth? She of course thinks the gap is super cool. I was informed that they “look like awesome fangs” and that she thought she looked “kinda gothy”. Mac is much less inclined to pose for a photo, but he did like his gladiator costume. 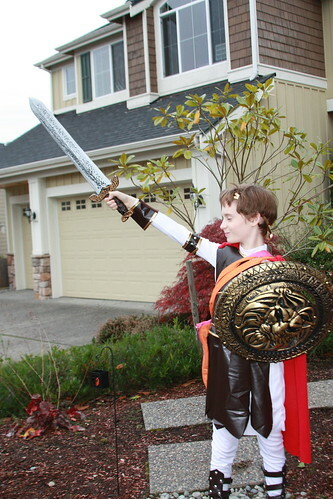 I wish he’d pick a costume without a weapon, but he is a boy and I hear it’s hardwired. At least this one didn’t make any noise (unlike last year’s Indiana Jones whip)! 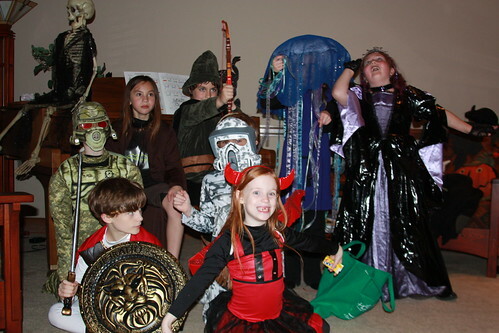 This year, like every Halloween since the kids were little (this is our 9th year), we had a pot luck dinner with a big group of friends and the kids all trick-or-treated together. They had so much fun being together and the parents get to have some fun too. Good food and company is way more exciting than a Snickers bar. For the first time the older kids got to go out by themselves. It was a much bigger deal for all the mom’s than it was for the kids, but everyone survived. There was little drama over a lost cell phone, but it was found and not even lost cell phones can put a damper on a really good candy high.